Apple devices rule the world, at least according to Apple CEO Tim Cook during the company's iPhone 5 press conference Wednesday. Apple's iPads hold a commanding 68 percent of the tablet market, Cook revealed, up from 62 percent from this time last year. As for sales, 84 million iPads have sold through June 2012. Last quarter alone, 17 million iPads were picked up by Apple customers. These figures put PCs to shame. 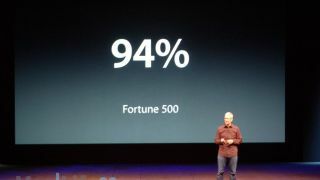 "Now to put this in perspective, we sold more iPads than any PC manufacturer sold of their entire lineup, Cook said. iPads account for 91 percent of all web traffic, Cook revealed, and over 250,000 apps have been created for the signature tablet to date. TechRadar is live from the event, where the iPhone 5 is expected to be announced.